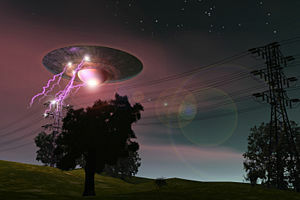 In upcoming interviews on The Psychic Viewpoint, on Psychic Access Talk Radio, I will be interviewing several persons that have had experiences with aliens, or who have been contacted by aliens or extraterrestrials (ET’s). Many of these experiences are accounts of events that have occurred in remote areas, probably so as to not frighten the angst ridden human populous. But many live to tell a good story on how they were first contacted by ET’s and how their lives evolved from these experiences. I have had the unique privilege to be witness to a UFO sighting. It was back in 1977. My boy had just turned 9 years old. We lived in Upstate New York, in Westchester (anything past Yonkers was up-state to us). It happened on a Monday night. We were on our way to a decent Chinese dinner in Ossining. We were on Route 9, traveling at about 60 miles per hour – a similar speed to the ten other cars that were traveling with us.